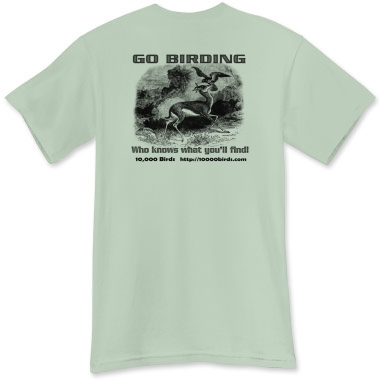 Bird watchers of the world, your t-shirts have arrived! Well, at least some of them have. We are excited to announce the first run, collector’s edition, ever so stylish 10,000 Birds t-shirts. Charlie’s motto, “Sleep can wait… I’m going birding!” is undoubtedly shared by many of you. 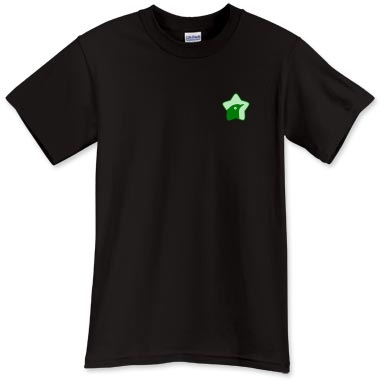 Let the world know that you have your priorities straight with this handsome shirt emblazoned with our birdstar logo. 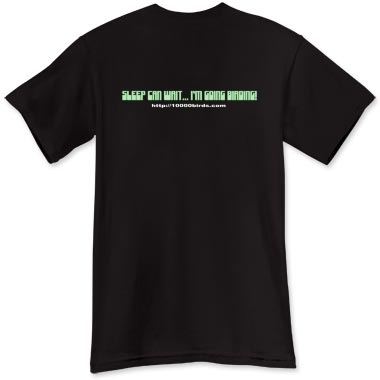 The Sleep Can Wait shirt comes in 31 colors, but urbanites like myself prefer basic black. Our second selection flaunts a stunning line drawing of a Northern Goshawk on the front and a vintage illustration of a falcon tangling with a deer on the back. Go birding… who knows what you’ll find! This shirt comes in a plethora of pastels like Serene Green above. We decided, after extensive research, to use Printfection as our print-on-demand provider. Their shirts are of exceptional quality and comfort. The ink utilized in their digital printing process is much softer and more durable than the plastic-like inks used in screen printing, which means you can hardly even feel the ink on the shirt. Digital printing mitigates fading and prevents cracking of the design even after repeated washings. Plus, with print-on-demand, you have a huge range of colors and sizes to choose from. 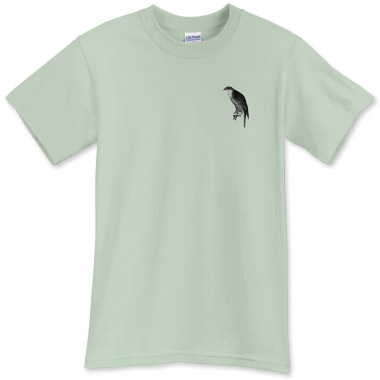 So pick up your 10,000 Birds T-shirt today! Darker colors cost more than light ones, so play around with the options for a shirt until you find the selection that suits you best. And once you do order a shirt, please let us know what style and color you selected. If you’re a looking for an option (long sleeves, women’s fitted, etc.) or item (hats, aprons) we don’t offer yet, please let us know about that as well! Oh, they are way cool!